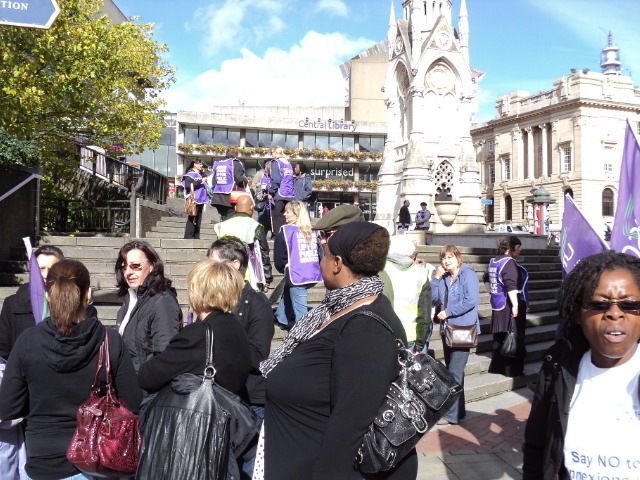 UNISON members working for Birmingham City Council were on strike again today, due to changes being imposed on their contracts by the council, which will see pay cuts and changes to conditions that mean workers will be told to do any job on their pay grade, at any location in the city, working any hours. 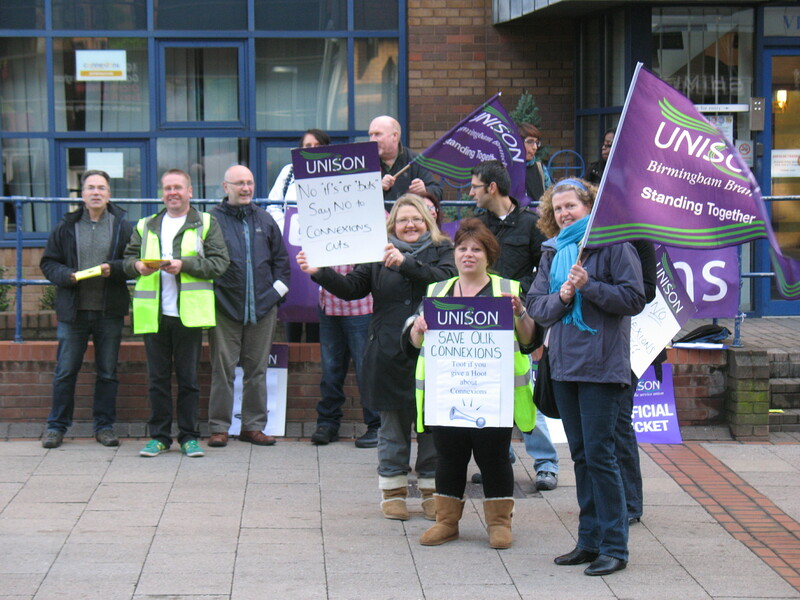 We have previously reported on the contract changes, that will see workers on £13,000/year losing as much as £4,000, today we will let the pictures tell the story, and given the amount of press that was around today, will provide links to other places reporting. 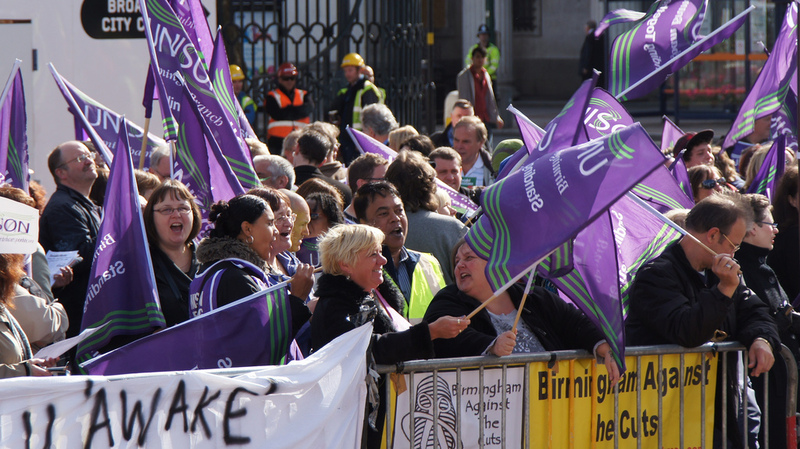 Unison workers at Birmingham City Council will be on strike tomorrow, over pay cuts and changes to conditions. 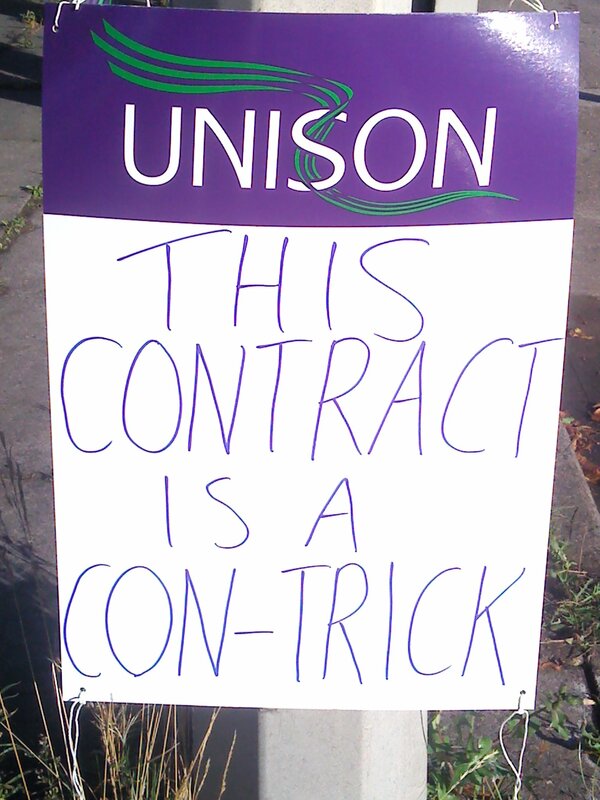 The strike has been timed to coincide with the final day of the Liberal Democrat conference, as we have a ConDem coalition locally that is forcing this contract onto the council workers. 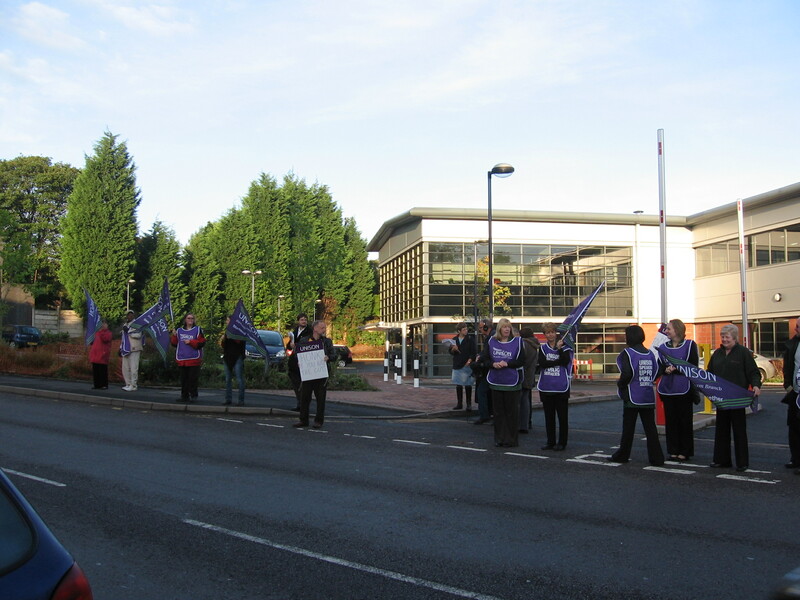 Picket lines will run at workplaces from 7am-10am, followed by a static demonstration outside the ICC from 10:30am-11:30am, and a mass members meeting at 12noon. 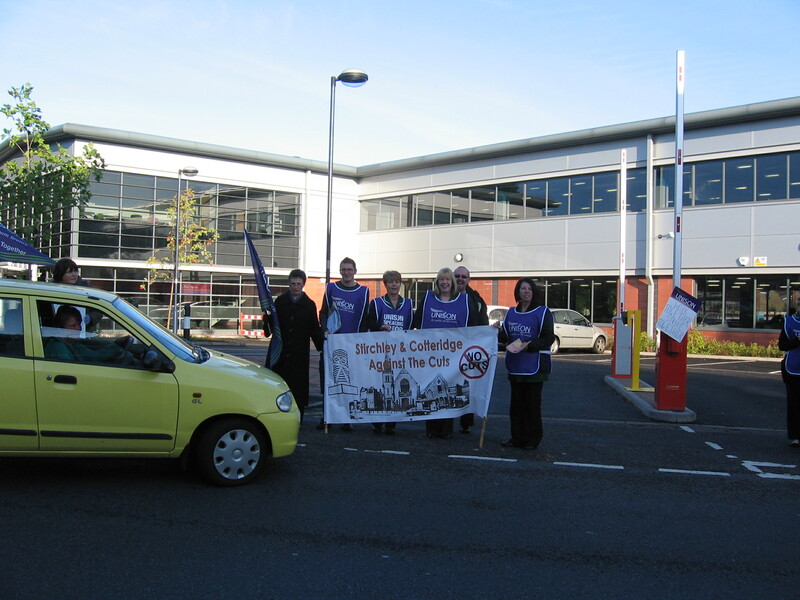 If you can go to a council workplace and show your solidarity with striking workers it is sure to be appreciated. 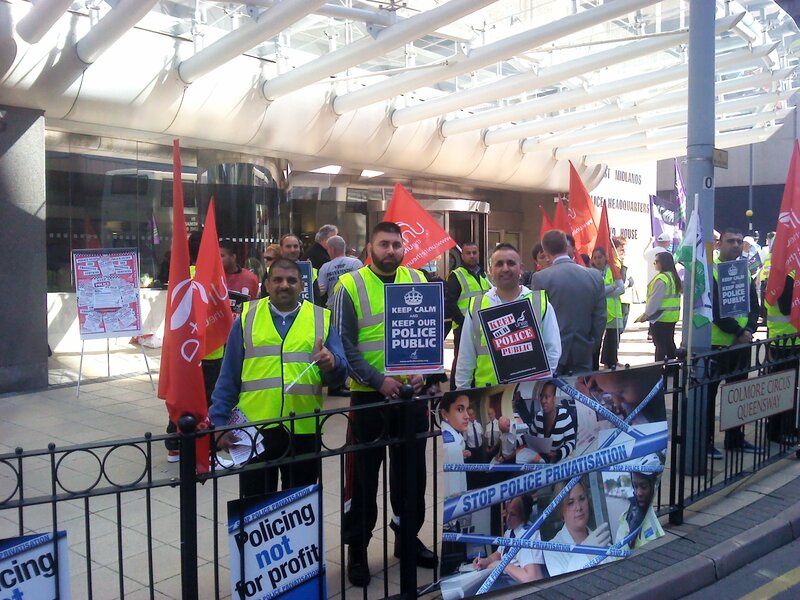 Also happening tomorrow is a march about the potential closure of the Bull Ring Markets, assembling at the markets at 12:30 and marching to the ICC – more information on the meeting and the threat to this business and jobs is available on the Save Our Markets website. These events will round off a week of protest at the Lib Dem conference, which began on Friday with a banner drop by NCAFC activists – for which one has been held in remand, and will be imprisoned for at least 10 days – and a demonstration with thousands of people on Sunday. 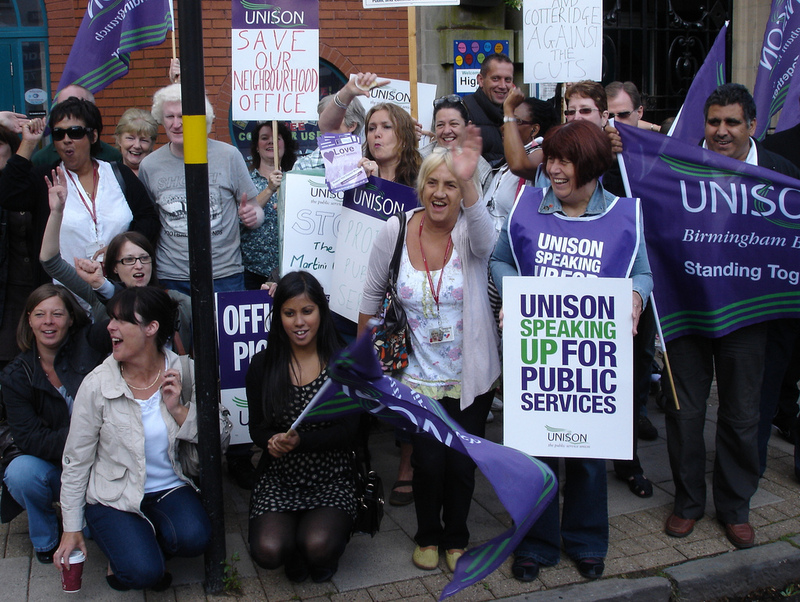 With Unison council workers going on strike on the 21st, now is a good time to write to our local newspapers expressing our support for their actions to defend their pay and conditions, and our services. 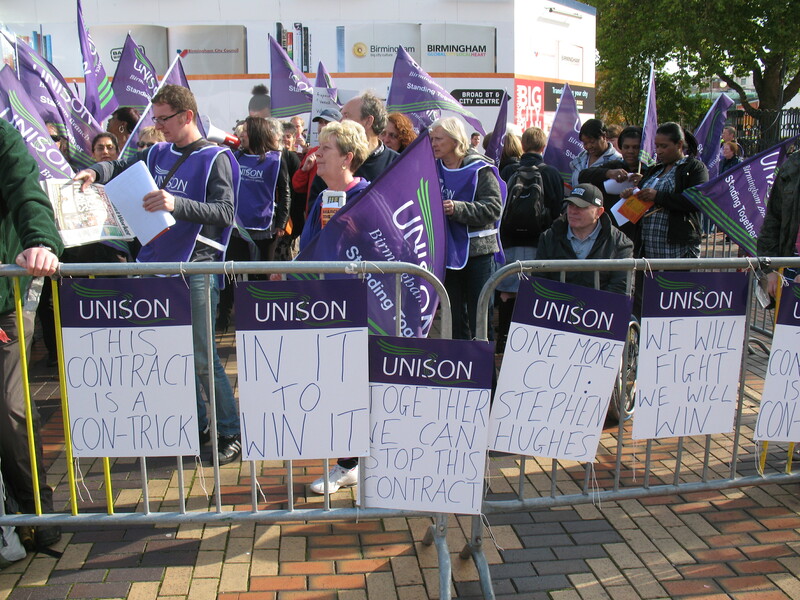 A series of positive letters in the Birmingham Mail, Post or Sutton Observer will have a couple of effects – firstly, it makes it more likely for the papers to cover the strike itself, and to do so in a positive manner. 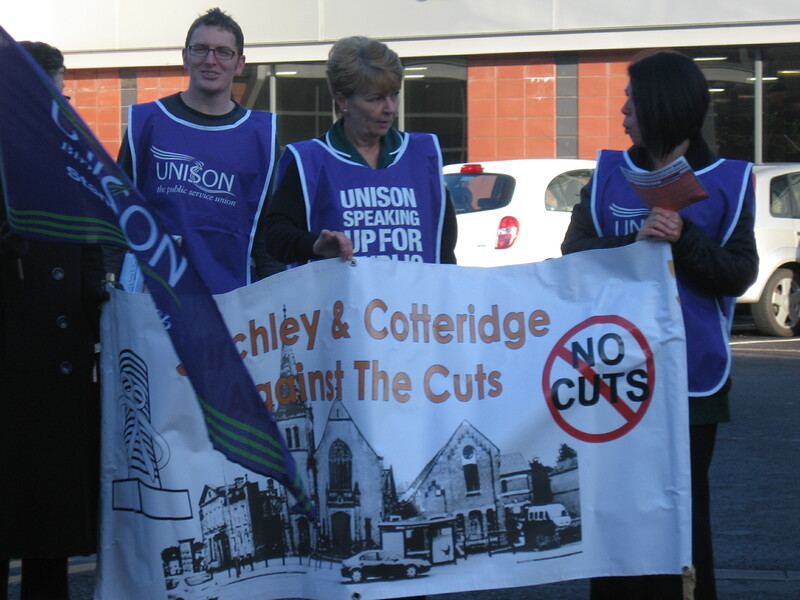 Secondly it will encourage GMB, UCATT and Unite council workers to vote for strike action in their ballots. 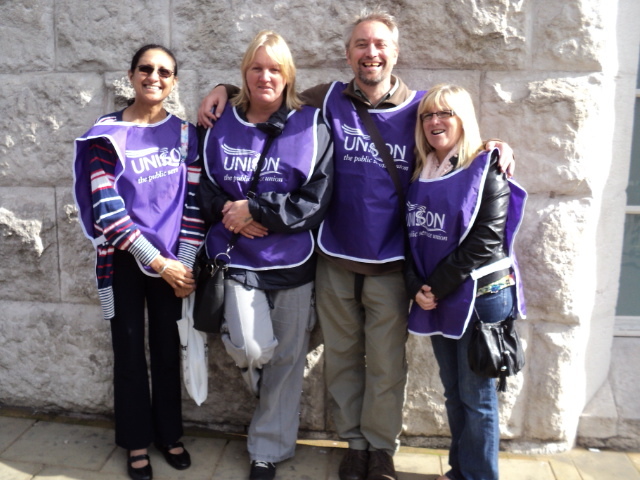 It may also encourage other public sector workers to strike, or non-unionised members to join up. And of course these letters will also tell workers going on strike that they have the support of the people of the city, the people who through council tax, actually pay their wages and pay for the provision of the services. Whilst we might provide a form letter if we were asking you to write to MPs, for this a form letter is no use, each letter needs to be personally written.. but here are some facts you might wish to include, that have been mentioned by Graeme Horn at our meeting last week, Caroline Johnson at previous meetings, or from Unison newsletters. These are real examples of pay cuts that will happen if the new contract takes effect. Mrs F, who will lose 30% of their pay – taking a whopping £4,453.35 pay cut from a £14,621.59 salary. One home carer who is currently on around £22,000/year has been told he will be losing £6,000/year under the new contract – a 36% pay cut! In addition to pay cuts, there are changes in conditions you can mention. This contract will mean that workers can be made to work any job (at their pay grade), doing any hours, at any location in the city. This means that someone who signed up to a job in a library near their home, working on weekdays to fit around their children, could be told to go and work in a housing office, across the other side of the city on weekends. Condition changes such as these are intolerable, and represent something totally different to the contracts that council workers signed up to. Whilst it may be acceptable for someone to choose a job whose location, hours or even duties change with no notice, it cannot be acceptable to force those conditions onto an existing workforce. It is hard to believe that people with a family, friends and social network around them would be happy to work under such conditions and insecurity. We are often told that public sector workers do their jobs because they are a vocation, but how can you have a vocation when your job role might change at no notice? Changes to pay and conditions such as these will only serve to worsen the provision of council services, by acting as a disincentive for people to apply for roles. 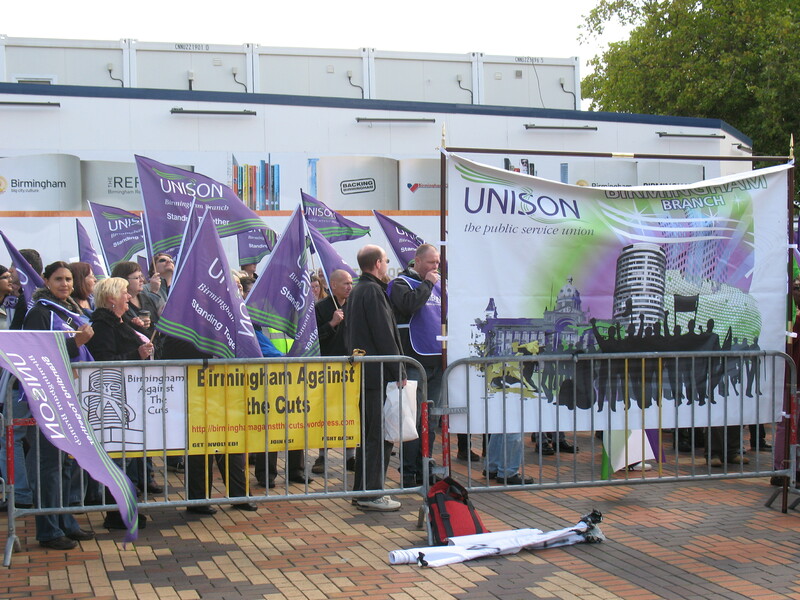 In many cases, it may actually make it impossible for someone to work for the council, as they made need the security of a set location and hours in order to fit with their commitments outside of work (such as bringing up a family – something which the ConDem coalition nationally, if not locally, are very keen on). I could probably have a rant about how these changes will not help to build stronger family units, but perhaps one of you could think about phrasing that in a constructive manner for your letter to the newspaper? 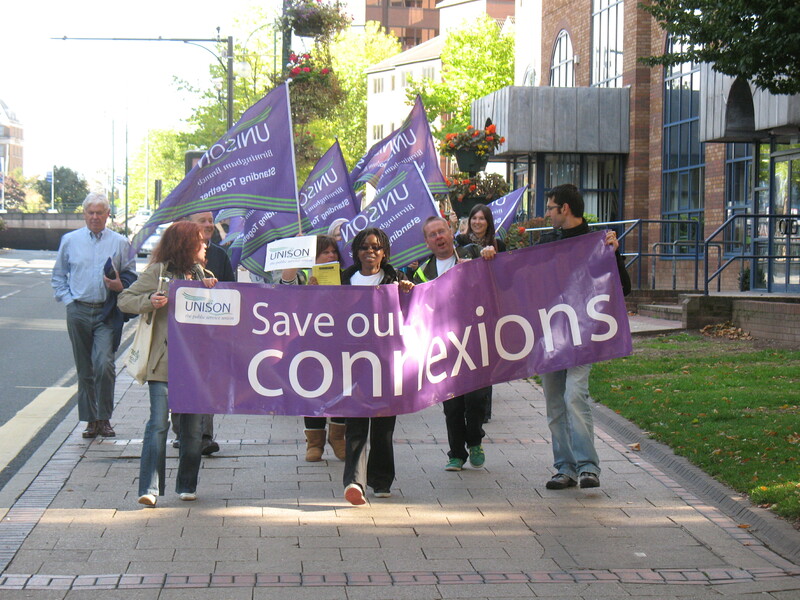 If you are a regular user of any council service – and most of us are, in one way or another – you could write a letter from that perspective – that you support the strike, because you recognise the attack on the service you use that these pay and condition changes represent. These kinds of letters are always good. You might think to comment on how the refuse workers cleaned up the city after the riots – and this is how we reward them! 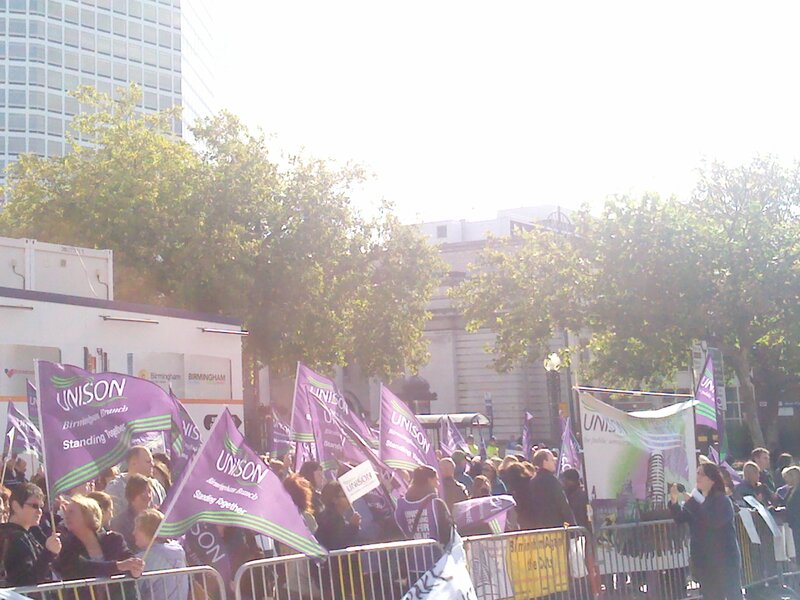 And if you want to mention the Liberal Democrat conference demonstration on Sunday 18th, that’d be grand. 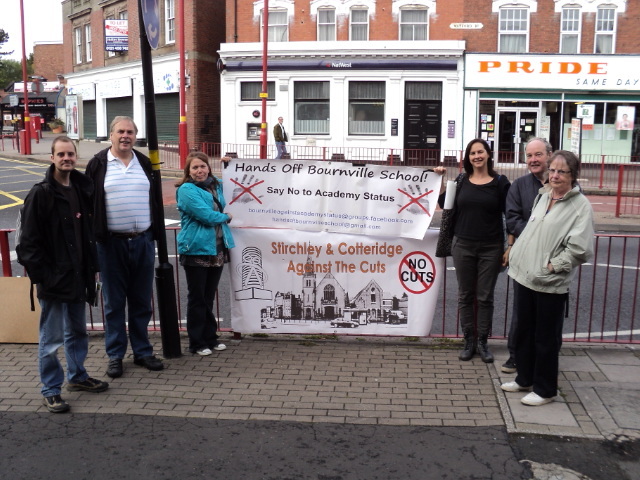 We enourage everyone to show your support for our council workers and the services they provide by attending a picket line, or commenting here to let council workers know that you support them. 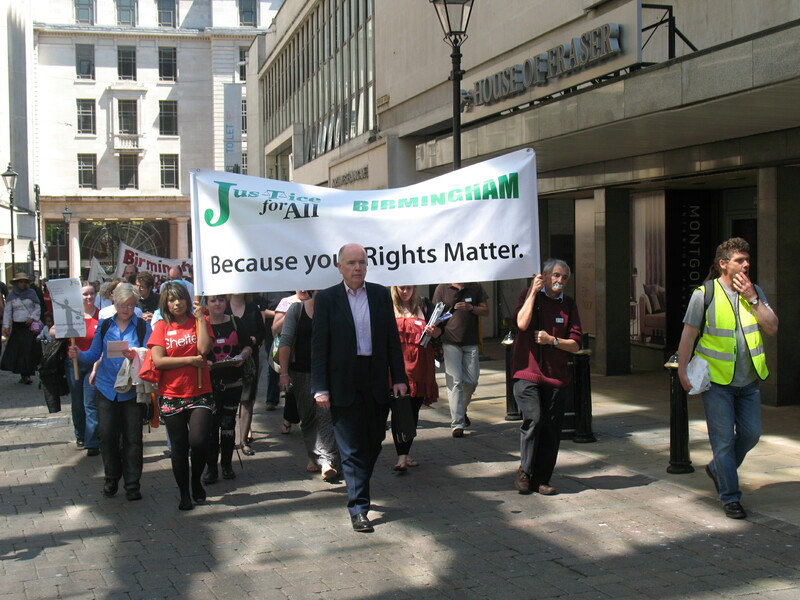 It is now time to step up our campaign against the new Birmingham Contract. 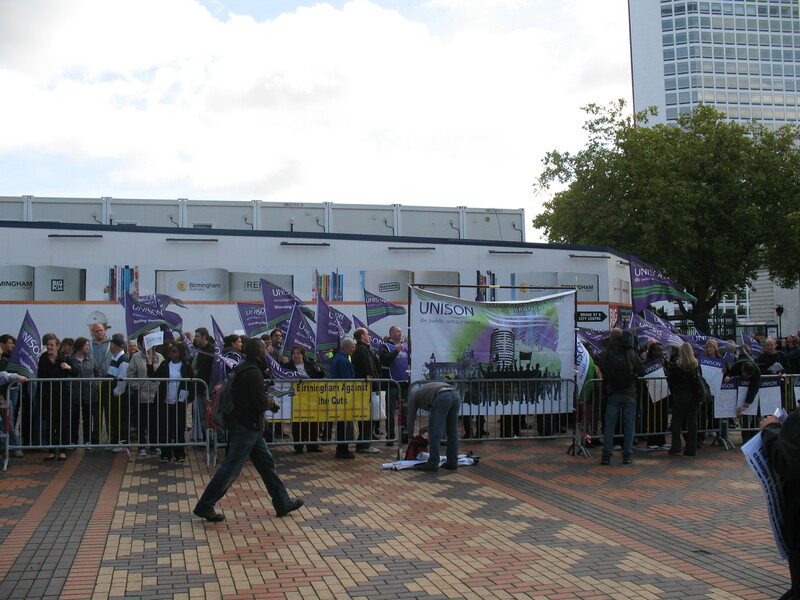 We have called a one day strike on the last day of the national Liberal Democrat Party conference on Wednesday 21st September. The Lib-Dems in Birmingham are part of the council’s Con-Dem Coalition. 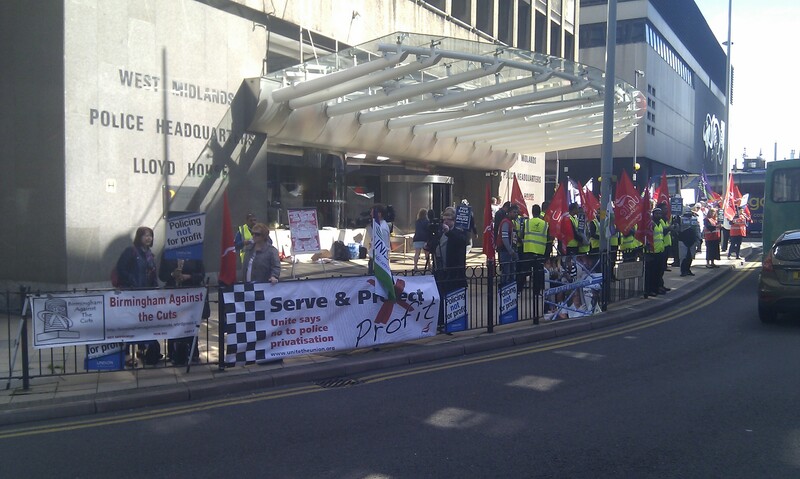 Birmingham is their flagship council. 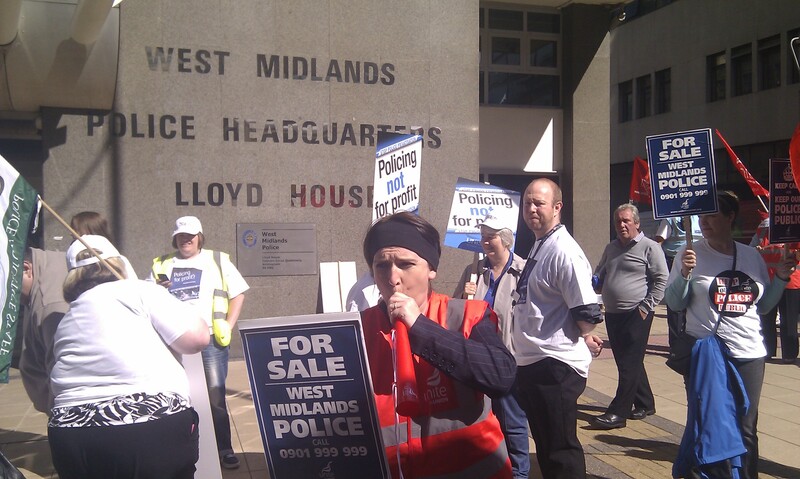 This is a unique chance to show the country what they are doing in Birmingham. we expect to get massive publicity for our dispute and to put huge political pressure on the Lib-Dems to back down. 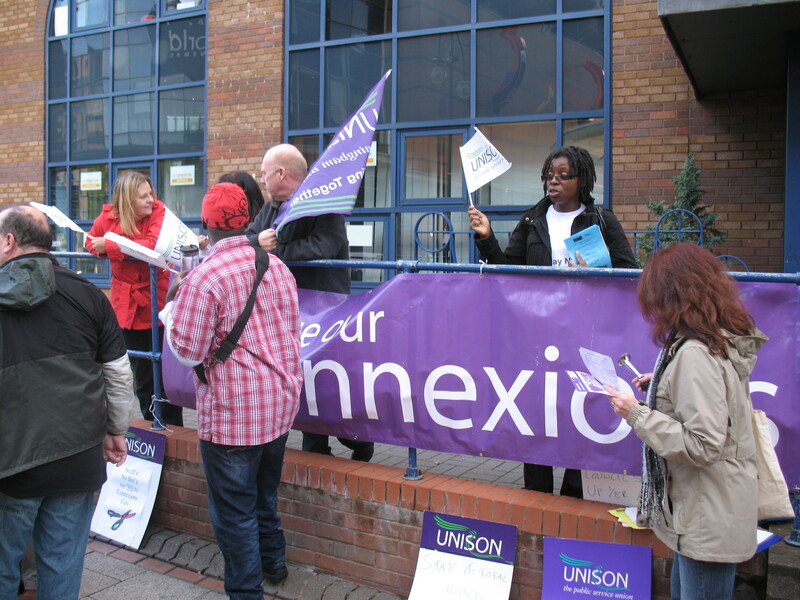 This time we expect to be joined by the council’s second largest union, GMB, who are balloting as we go to print, and by UCATT. 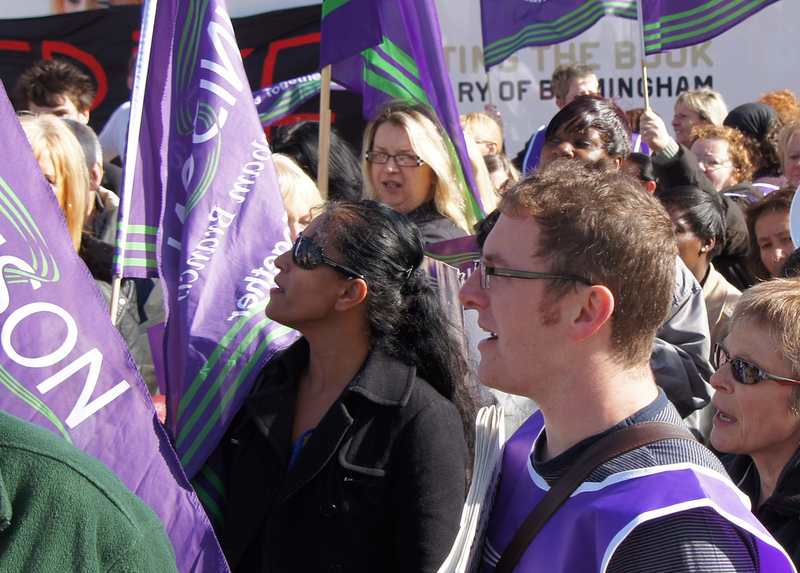 We are organising a mass members meeting on the day of the strike. We want to talk to all of you, our members, about where we go next. We have more strikes planned and we are also arranging for the mass lobbying of councillors surgeries and public constituency meetings. This is a dispute we can win if we all strike, lobby and campaign together. 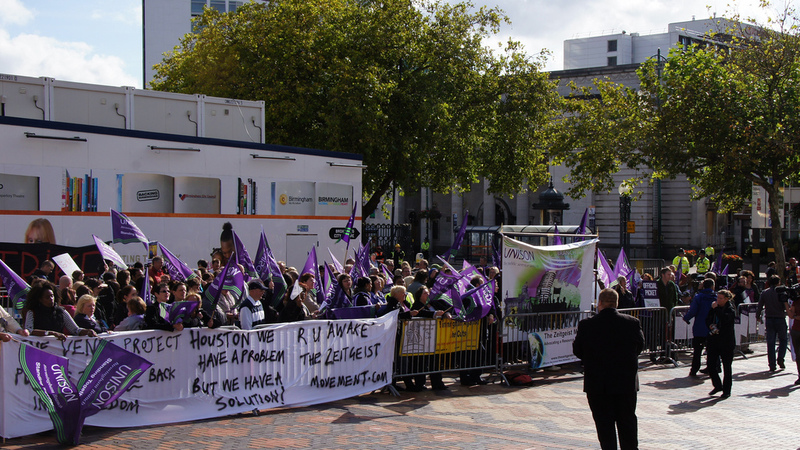 Birmingham Against the Cuts and Right to Work are pleased to announce the details of our next public meeting, to be held in the run up to the Liberal Democrat conference demonstration on Sunday 18th September. Jack Dromey is the Labour MP for Erdington. 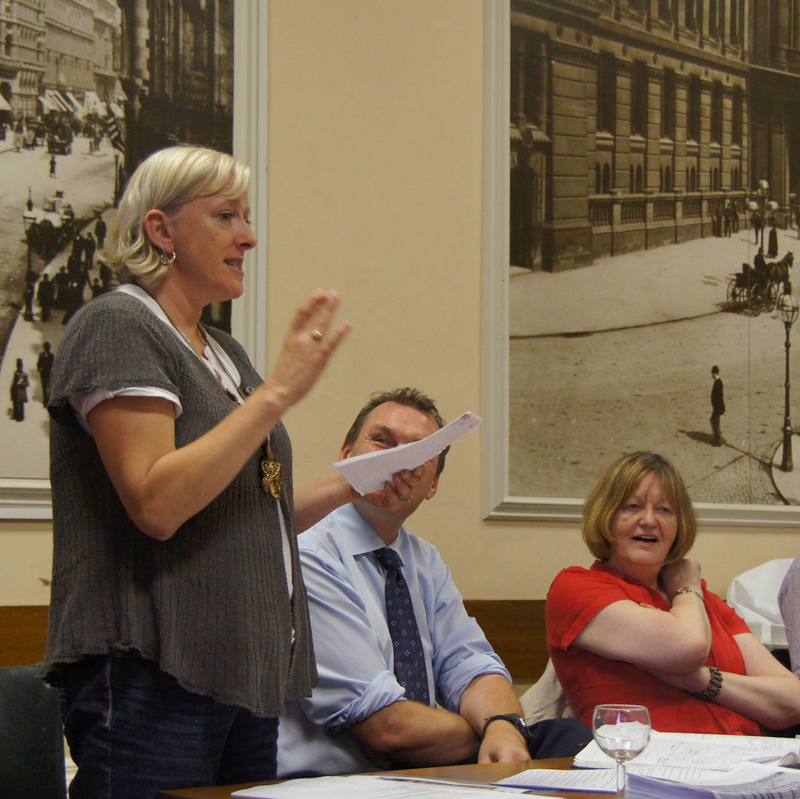 He has been outspoken against the cuts, and has supported many events locally, including the Justice for All march, and gave an excellent speech at our public meeting on May 26th. Jody McIntyre is a journalist and political activist who was pulled out of his wheelchair by police during the student demonstration on the 9th December. Ever passionate and always interesting, it will be a pleasure to welcome Jody to our city. 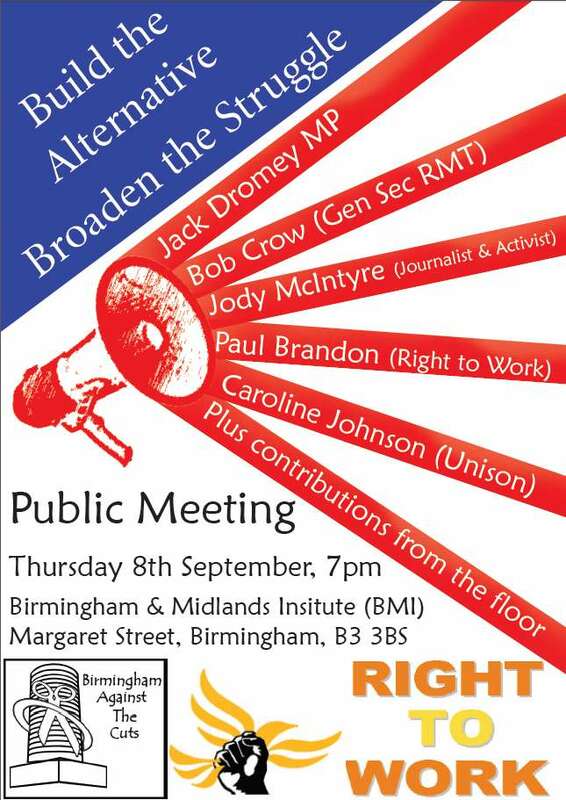 Paul Brandon is the chair of the Right to Work coalition, who have called this meeting jointly with Birmingham Against the Cuts. 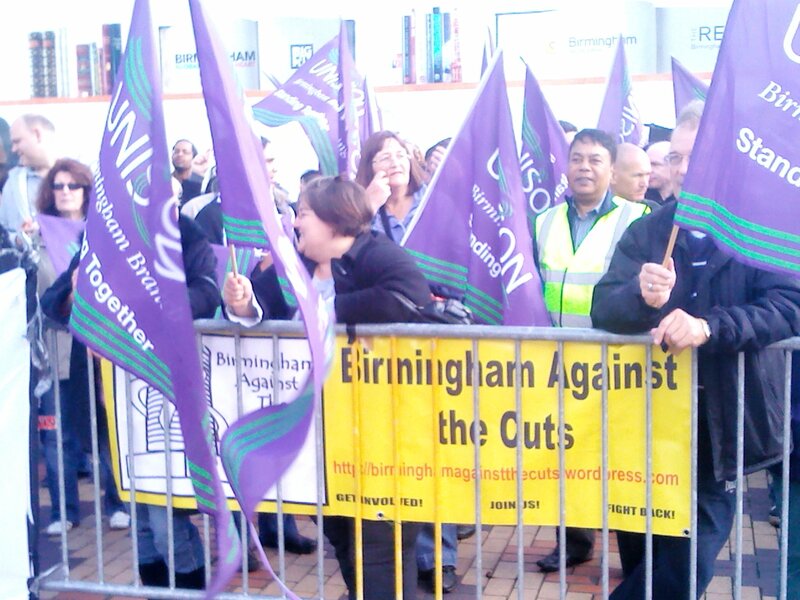 Right to Work were instrumental in calling a demonstration at the Liberal Democrat conference, which was quickly backed by all the local anti-cuts groups working in the West Midlands and by the Regional TUC, before being adopted by national TUC. 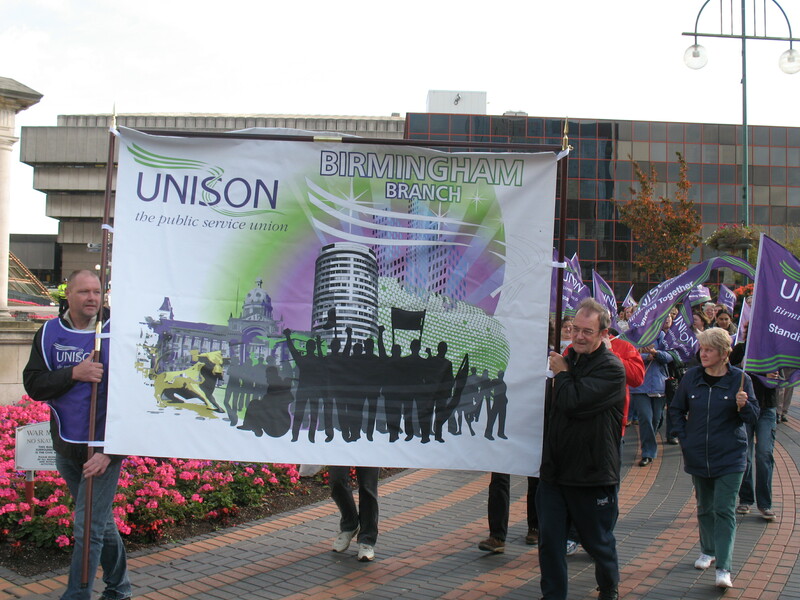 Chaired by Caroline Johnson, Chair of Birmingham Against the Cuts and joint branch-secretary of Birmingham Unison, whose council workers were on strike on the 30th June and are likely to take more strike action in defence of pay and conditions during the Autumn. We would like to welcome everyone to come and listen to these speakers, and will ensure that there is no confusion over timings and that there is plenty of time for us to take contributions from the floor as we build towards the Liberal Democrat conference demonstration in Birmingham, and other national demonstrations around the UK – at the Tory Party conference in Manchester, on October 2nd; in Coventry on October 22nd for the regional demonstration of the YFJ Jarrow March recreation, and in London on November 5th for their national demonstration and the 9th for NCAFC demonstration against the privatisation of education. We are looking at leafletting on weekday evenings and mornings as well as weekends, all around the city at train stations, football grounds, local high streets or other areas, as well as the city centre so let us know when you would be available and what area(s) you could get to. We will have printed leaflets for this event available from Friday, and should be leafletting in the city centre on Saturday. 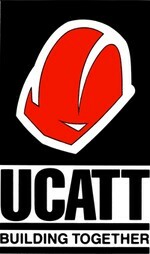 Please keep an eye on this website for details later this week. Around all of this there will be more local and regional events happening, with the vote on the health reform bill the day before this meeting, keep up to date with events with Save our NHS West Midlands. You can download an A4 double sided version of the flyer here to email to other people. A5 flyers will be available from the weekend so let us know if you want some to deliver. 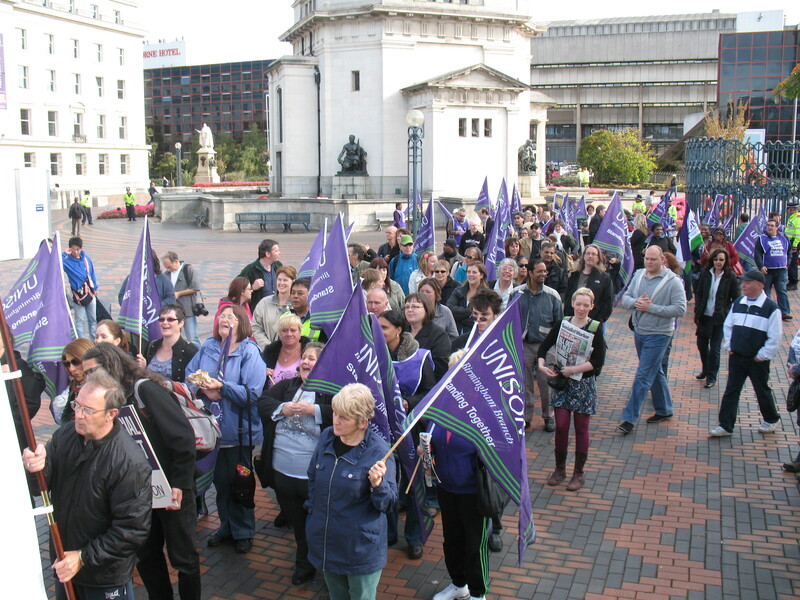 UNITE and UCATT unions at Birmingham City Council will be balloting for strikes over contract changes which will see workers lose shift allowances, and be told they can work any job, any place at any time. These ballots will take place in August. 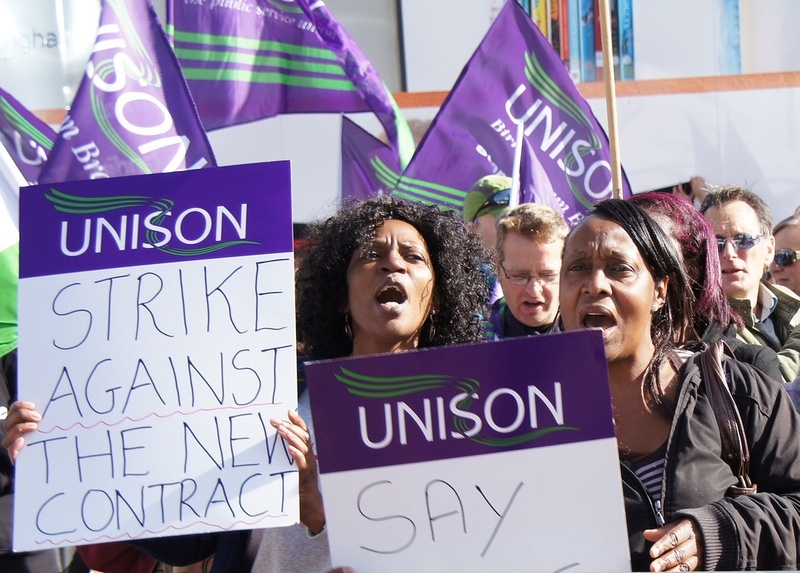 GMB are currently deciding if they will ballot their members for strike, whilst UNISON have already balloted, and took strike action on 30th June. 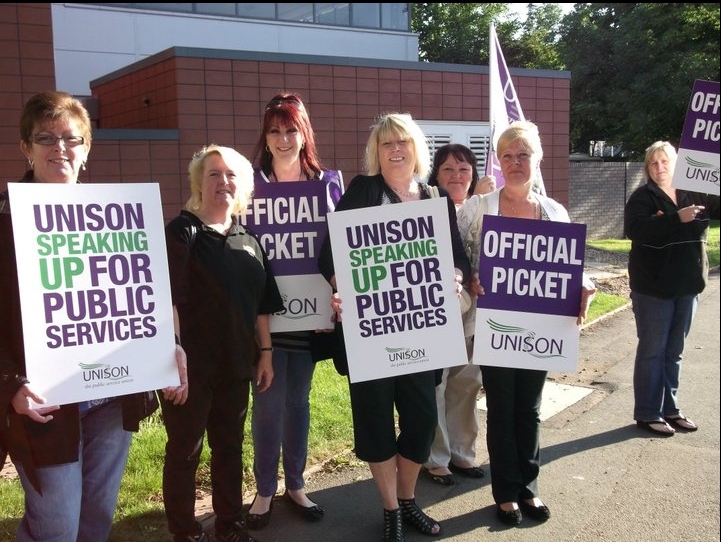 We are hearing that there are plans for strike action in September and October, as well as periods of work-to-rule industrial action. The changes to the contract affect all workers below grade 4 (obviously cuts don’t come to management, only to the lower paid workers – just as nationally cuts aren’t affecting the bankers or super-rich, just ordinary working class and average earners – truly giving the lie to the ConDems well worn cry of we are all in it together). 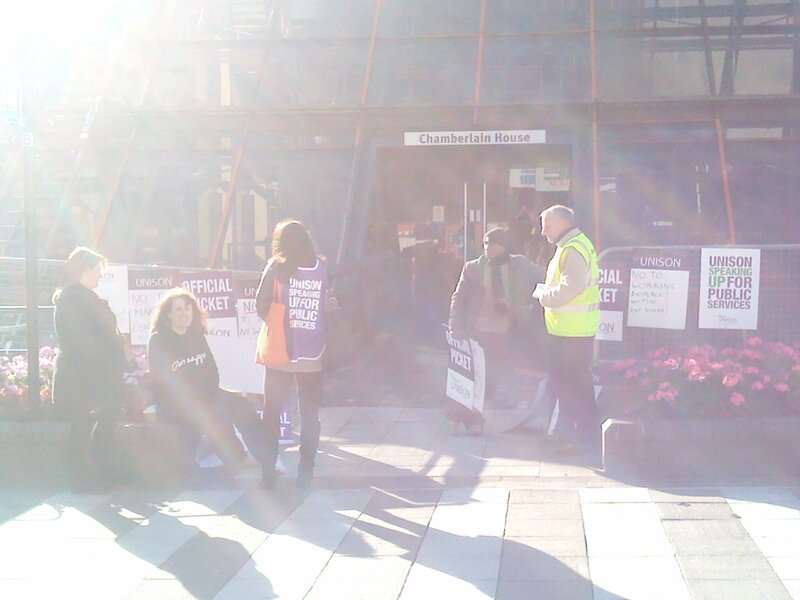 At the moment, the council are holding 1 to 1 meetings between managers and their workers to explain individually how much money they will be losing and asking them to sign the contract. We have heard of managers walking out of these sessions in disbelief as to just how much people will be losing. 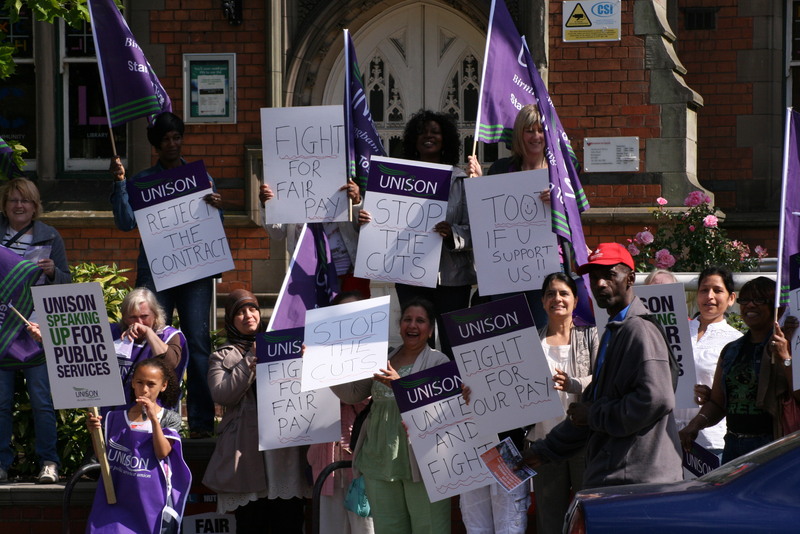 One home carer who is currently on around £22,000/year has been told he will be losing £6,000/year under the new contract – a 36% pay cut! He has said that he will no longer be able to afford his mortgage, and will lose his house. This is someone who travels around Birmingham supporting vulnerable people to help them maintain an independent life, and live in their own home. A variety of people make use of these services, mostly elderly or disabled people but also adults with learning difficulties who require support for instance to cook or clean the house. In addition to pay cuts, workers are being told that the new contract means that they can have their job changed to any other job at their pay grade, in any location in the city, working any hours. This means someone who has accepted a job in their local area with times to fit around looking after a family can be told to work evenings and weekends on the other side of the city, and they will have to do it or resign. Such conditions being placed on workers cannot be accepted. 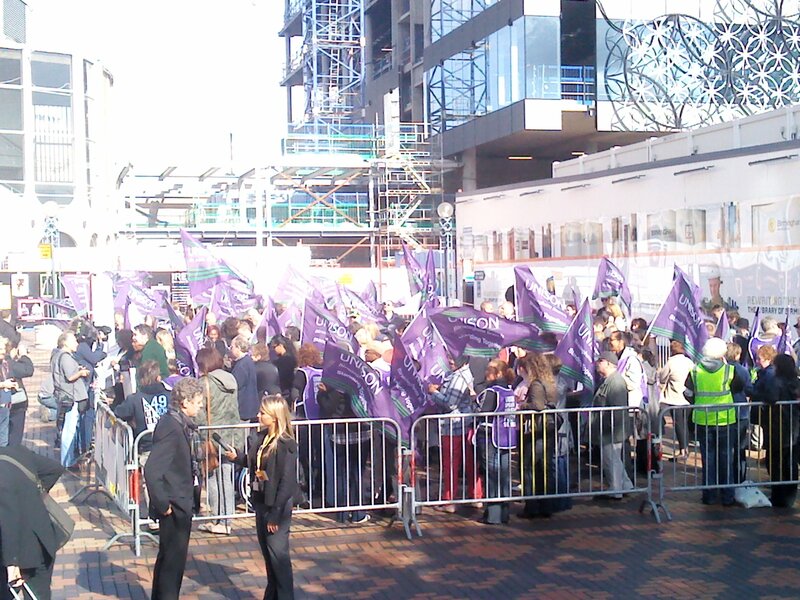 At Birmingham Against the Cuts, we would encourage all members to vote yes to strike action, to show the council that such savage cuts cannot be implemented, and that the council will not function until they back down.